As the Chair of the Department of Health Policy and Management, Professor Annette Choolfaian helped shape the careers of countless health administrators and professionals. She was instrumental in the success of the School of Health Sciences and Practice. 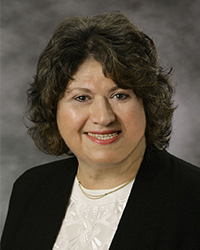 The Professor Annette Choolfaian Endowed Scholarship was established in 2016 to pay tribute to her illustrious and accomplished career of more than 20 years at NYMC. This scholarship will be awarded to an SHSP student who meets all the academic standards and demonstrates a financial need for assistance.